If you have asthma, you look for ways to reduce your symptoms. And chances are you’ve looked down at the floor a time or two, wondering how it impacts your health. The key may be in what the flooring is made of rather than a specific type of flooring. 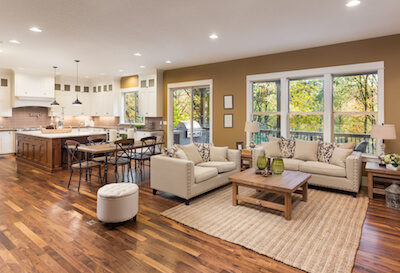 The more conscious you are about the products and manufacturing process, the better choice you can make for the flooring installed inside your home. Carpets can cause potential problems to live within the fibers. However, not all carpets are bad. The key is to ask a flooring specialist about the best choices for you. Be conscious of the fiber the carpet is made from. Natural fibers such as wool can provide a clean environment. You can also select hypoallergenic synthetic fibers designed to stay cleaner over time. It’s often the chemicals used in the fibers, padding, or adhesives that cause problems. Look for Green Labels to choose better options. Clean your carpets regularly. Also, have a no-shoe policy to avoid tracking in dirt and other contaminants. Wood flooring is a good choice for asthma sufferers because its smooth surface does not trap dust mites or pet dander in the fibers. Be sure you install it without your loved one around. Dust from sawing and sanding can linger in the air for quite some time. Be sure you clear out your home before entering once again. Dust frequently with a static dust mop to remove dust. Select a low volatile organic compound (low VOC) sealer, as this won’t emit fumes that normally come from other types of sealers. Wood laminate can also be an option, but only if the laminate materials are bound together with high VOC content. Offgassing can occur from formaldehyde and other chemicals used in the process. Ask about the entire process if you are concerned. Cork – naturally resists water, mold, and mildew, making it a natural choice that’s good for you and the environment. Ceramic Tile – the hard, durable surface can be a great option, especially in high traffic areas. They are easy to clean and maintain, just avoid high VOC adhesives when you install. Linoleum – this is made from natural materials (linseed oil, pine resin, and powdered wood) and offers a durable option for any room in your home. Just be sure you select low VOC options for both the adhesive and the linoleum products. Have allergies? Let us help make the right selection for you.